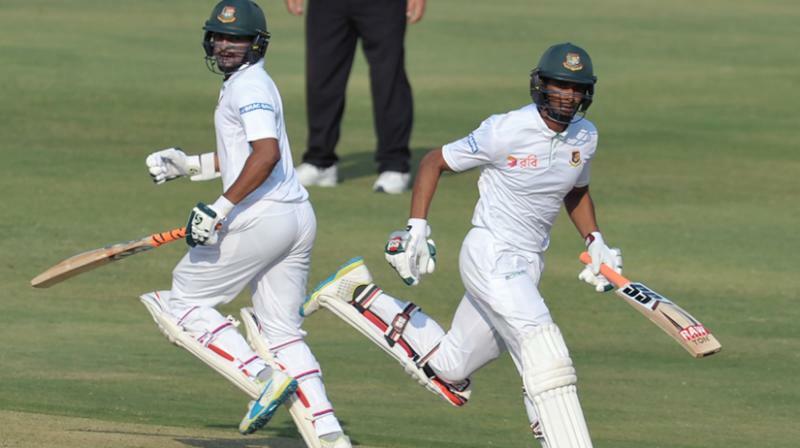 Shakib Al Hasan’s fifty and Mahmudullah’s steady batting help to retain in a strong position as Tigers scored 259 runs by losing 5 wickets at the end of the first day of the second test against West Indies in at Sher-e-Bangla National Cricket Stadium in Mirpur on Friday. Shakib [55*runs in 113 balls]and Mahmudullah [31* runs in 59 balls] were in the crease at the end of the first day. From the Windies side, Devendra Bishoo took two wickets and Kemar Roach, Roston Chase, Shermon Lewis took one wicket each. Having won the toss Bangladesh skipper Shakib Al Hasan decided to bat and the Tigers lost their first wicket in the morning season as Soumya Sarkar fell to off break spinner Roston Chase. Soumya scores 19 runs. Meanwhile, left-handed debutant Shadman Islam struck a solid 76 off 199 to propel Bangladesh to 176 runs at the tea break. Earlier, Tigers came into this match with two changes to the playing XI as they dropped Imrul Kayes and Mustafizur Rahman. While Imrul was ruled out for injury and 23-year-old opener Shadman Islam replaced him, Mustafizur is overlooked by the team management to make a way for Liton Das. 259/5; Shadman Islam 76, Mominul Haque 29, Mohammad Mithun 29, Shakib Al Hasan 55*, Mahmudullah 31*; Devendra Bishoo 69/2, Kemar Roach 38/1, Roston Chase 61/1, Shermon Lewis 35/1.